Ships from and sold by Mons Peak IX, USA. Sold by Insole Dept and ships from Amazon Fulfillment. 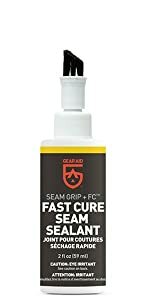 Seam Grip FC is a fast-curing, water-based seam sealant. 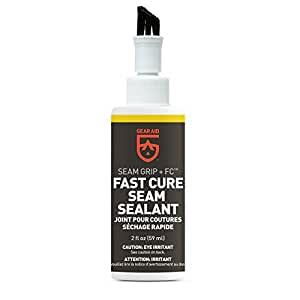 Previously known as Seam Sure, one bottle of this liquid sealer covers up to 60 ft of seams – making it perfect for family-sized tents, rainflies, tarps and pop-ups made of nylon, vinyl and more. Just apply a thin film to the inside seams and allow to dry. Don’t let rain make you miserable on your next outdoor adventure. 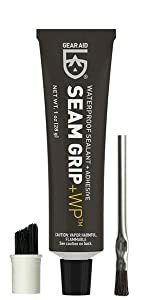 Seal out the weather by waterproofing your tent and rainfly with Seam Grip FC and stop leaks before they happen. The applicator is useless if used as instructed. I found a better way to use this if your tent is already standing. Dump all the goupy stuff out of the containter into a bowl and then use the applicator like a paint brush dipping it in the bowl of goup and then rubbing it on the seams. Took two bottles of this to cover all the internal seams of a 17x10 8 person tent. I also used 2 cans of Kiwi Camp Dry for the outside of the tent. sprayed it on and then rubbed it in real good with the green scratchy side of one of those yellow and green kitchen sponges. After it sit up and dried for two days we experienced 3 days of nonstop torrential rainstorms and then a week later 1 day of sleet and snow. ZERO water in my tent for both storms. 2.0 out of 5 starsDifficult to apply with provided materials, doesn't seem to be worth the effort or money. As some others have stated it is virtually impossible to use this with the application brush provided. By its very design it has to be held upside down which is just not reasonable to seal most seams. I had to pour the sealer into a bowl and apply with another brush. 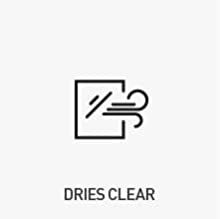 It took me 2 bottles and I was able to seal *most* seams in our 10x14 8 person tent and rainfly. I didn't have enough to get all seams, but I skipped those that seemed to be protected best by the fly. This was a brand new tent, so while it didn't have taped seams, they shouldn't have been very worn. We still had leaks through some of the window seams, etc. I treated the inside seams with this, and the outside of the tent and fly with the 3M waterproof spray. While either or both might have had some effect (I don't know what it would have been like had I not used either), even the both of them together couldn't provide a true water barrier. Based on performance and the difficulty/time to apply this, I would say it isn't worth it. The 3M spray has to be reapplied more often, but I would say a double coat of that sprayed on for rainy trips is probably easier and just as effective. 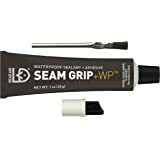 I purchased Gear Aid Seam Sure on the recommendation of an experienced backpacker working for the Wenzel tent company in Colorado. After reading numerous reviews about the application of this product, I didn't bother using the small brush on top of each bottle. Instead, I poured a small quantity into a tin can and applied it with a 1" foam paint brush. After setting up my new tent, I semi-liberally applied it on both interior sides of each seam of the tent from the floor up to the bottom of the net ceiling. One advantage to using the foam brush was when the sealer did puddle or run I was able to capture most of the excess with the brush. I used paper towels to capture the balance. Yes, some of the Seam Sure dried on my hands. Afterwards, I found it difficult to rub or wash off...a testimonial for this fine waterproofing product. 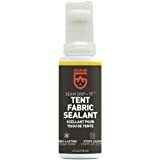 A complaint by others was that the 2 oz bottle did not seal an entire tent (size of their tent unmentioned). They also did not mention whether they used the (to me) inefficient brush on the bottle or a foam brush. For the record, I purchased a Wenzel Blue Ridge 14' x 9', 7-person family tent. I found that it required 3 bottles to sealer to barely cover all of the interior seams of this admittedly very large tent. In my case, I didn't have enough sealer left for sealing the rain fly but luckily discovered that Wenzel had taped the underside seams of its rain fly so I did not need a 4th or 5th bottle. 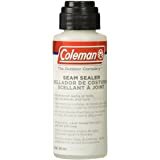 I do agree with others, though, that it would be nice if Seam Sure was available in a larger bottle. Bottom Line: I recommend this product. 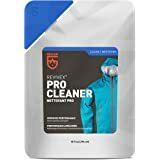 This is the other product I use to reseal a tent/rain fly so that its water proof. I paired this with the Polyurethane spray on from Texsport. 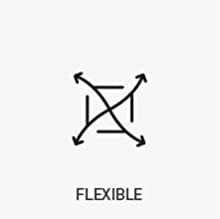 Utilizing both products you can save a tent or rain fly or give it more life so that you dont have to buy a new tent. 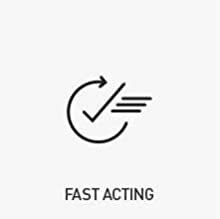 I outlined the process in my other review so I wont go over that again - but you do need this to run against all the seams on a tent. 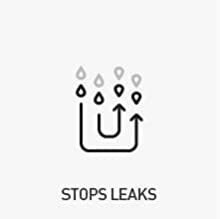 This will stop water from entering the seams which is usually the easiest entry points for water. The solution is a milky substance and you follow your seam lines with a little pressure on the cap. The brush allows for even spreading of the solution. When it dries it leaves a film that seals the seems. It works as planned and I can still do another tent or rain fly. It did rain last time I had this resealed tent and it held up. I tend to camp in the sierra backcountry and rain can come or go. I have used the tent in a recent cold weather camping trip and frost did build on the tent but as it turned into water it did not enter the tent. 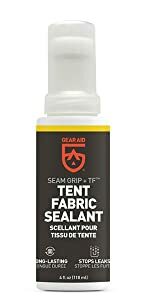 I would buy this again for any tent restoration I am doing, that paired with the Texsport polyurethane spray will save a decently aged tent. The bottle instructions say use a thin coat. 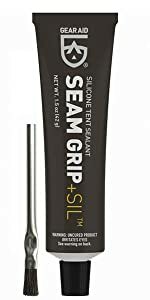 The tent says use a seam sealer generously. Up to you. I believe it works by soaking into the seam threads and expanding a little when it dries to block water from moving in those threads. 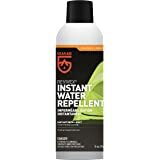 I applied it using a thin coat and was barely able to complete a 3 person tent and it's rain fly. 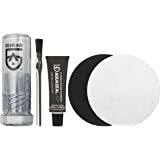 Do not try to use the built-in brush because when you are inside the tent and try to brush the liquid on it will run down the bottle on to your hand, never even making it to the built in application brush. The solution I used was to cut down a paper cup and then use a small brush (like that used in crafts or to paint models) to apply small amounts of it to the seams (dipping the small paintbrush in the liquid I poured into the cup). You can better control the amount applied to make a thin coat. You can seal rainfly seams more easily by installing the rainfly upside down. After it dried I closed up the tent, with the rainfly in place and misted it for a couple of hours with the hose (the nozzle of the hose was above the tent). The seams on the interior were dry. Then I adjusted the hose nozzle so that a heavy "rain" came down on the tent. After a couple of hours the seams on the interior were still dry. Then I adjusted the hose nozzle so that a driving "rain" came down on the tent (at an angle too). The interior seams were still dry. I guess the stuff works ok. 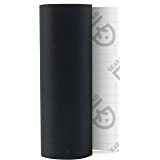 I was told by an REI guy that an even better solution is available from the same manufacturer - the stuff that comes in a tube, because it is easier to apply.